Tom PostTom Post - Page 2 of 8 - Learning Everyday. who suffer from poverty, hunger, disaster, and injustice. It’s a city on hills in the foothills of the Himalayan Mountains—-with a name that looks strange to western eyes. Aizawl. Aizawl (pronounced “Is-all”) perches precariously in the steep Himalayan foothills of North East India. It’s the cultural center of the Mizo people. A Welsh missionary named William Williams first brought news of Christ to the Mizo people 125 years ago, and they have become predominately Christian. The Presbyterian Church of Mizoram celebrated the missionary arrival on the Sunday we were in Aizawl. 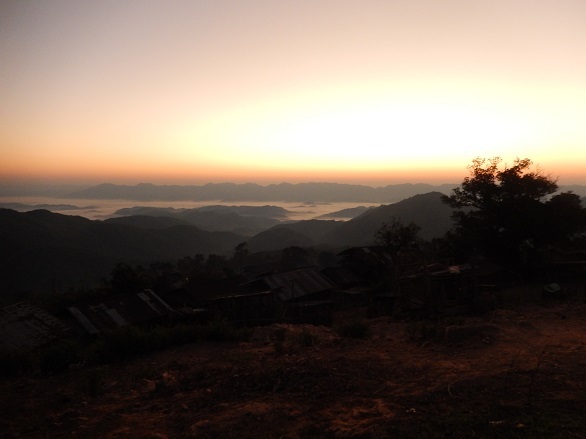 But, Aizawl also lies precariously close to the border with Myanmar (Burma) and to the influx of cheap heroin and more recently invented drugs that are tempting and enslaving their children. As a result of intravenous drug use AIDS has been spreading with tragic consequences. We heard of young people who inject heroin up to six times per day. This can result in horribly ulcerated bodies as in the photo below. 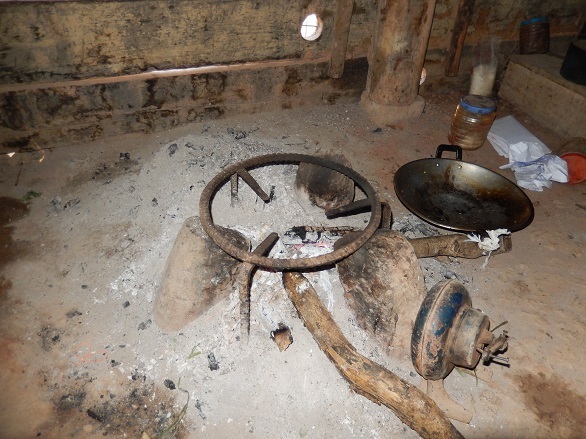 We visited a young couple who are both HIV positive as a result of their drug use. We heard a church leader say he was thankful that Shalom was doing what the churches seem unable to do. World Renew is privileged to help a courageous organization called Shalom to get hands-on involved with helping the teenagers of Aizawl to help their friends. With Shalom we are using funds raised in the EMBRACE AIDS campaign to enable the training of teenagers to use Facebook, WhatsApp, text messages and friendship coaching to help their friends face down the drug temptations and the potential enslavement and AIDS. Four HIV positive people, a medical doctor and a seminary graduate coordinator all work with the teen peer coaches. So, for me there is again wonder: at the way misuse of drugs destroys human dignity in the same place where a missionary miracle story happened, and at the way God’s kindness to humanity still shines through the people of SHALOM who have not turned their backs on the drug users and AIDs sufferers. 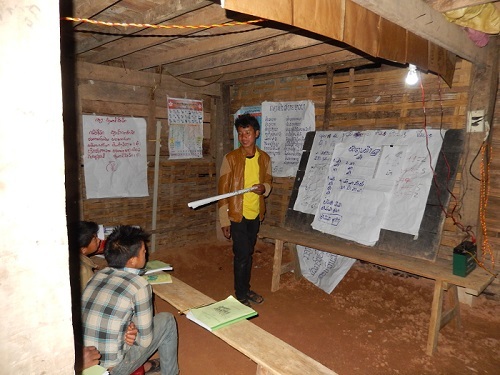 In the remote mountains of northern Laos World Renew works with people who, until this generation, never had the chance to go to school. Now, we are able to bring elementary schools to the villages! The Akha women in this picture of a village development committee meeting are using photos to help them prioritize their village actions. They wish that they could at least speak the majority language of Laos so that they could participate with more confidence in markets and other aspects of social life. 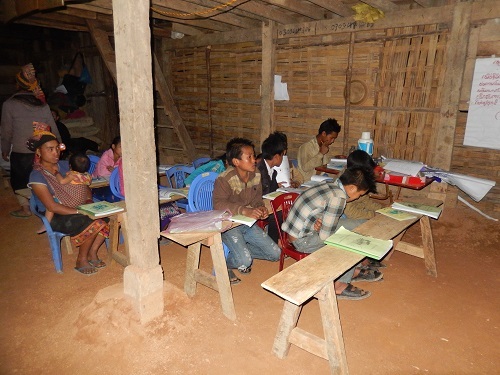 For teenagers and the most dedicated adults World Renew sponsors night literacy classes. 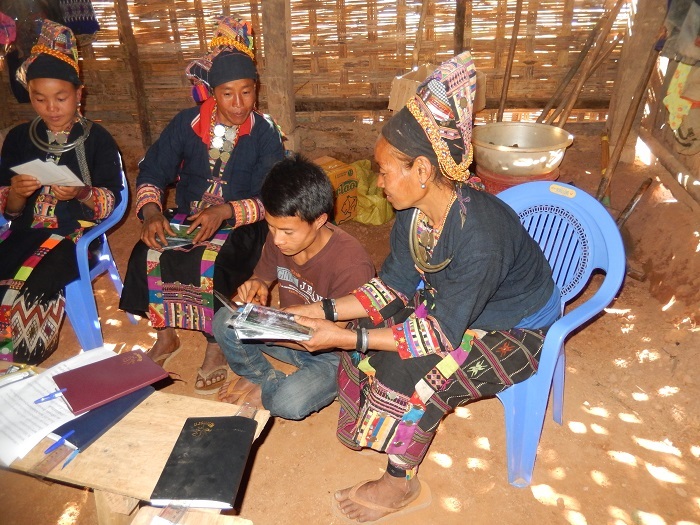 Here a dedicated community teacher takes on the added challenge of working with adults whose mother tongue is different than the majority language of Laos. To me, it seems like such a painstaking process. Here’s a riddle that’s hard for me to unravel. Last Saturday a friend of mine told me about his Mexican- American son who recently dropped out of community college even though he had full financial support. At least this son completed high school. But, this story and so many others leave me wondering what happens to the hunger to learn among so many of our children in the United States? Something powerful goes with eating cross culturally. Learning acceptance of others’ ways is one thing, for sure. Gratitude for others’ hospitality and care, is another thing, for sure. I notice that in the Bible, this was one of the really hard things for the Christians of the 1st century. In the book of Acts Peter needed a vision and something like a conversion experience to get over his prejudices about the Roman’s food and later, in the book of Galatians, he got a stern confrontation from Paul about his food hypocrisy. 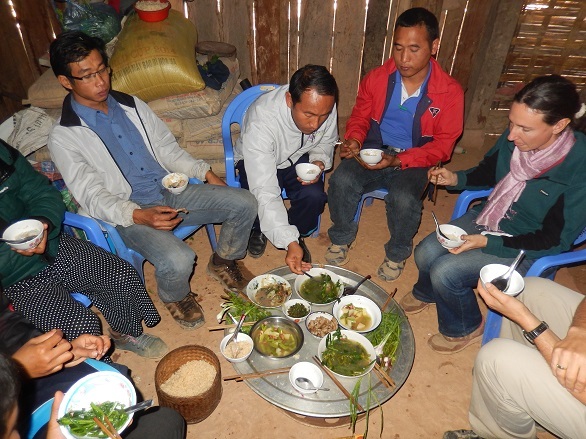 In Laos I experienced the hospitality of Akha villagers to have us sleep in their homes, cook in their kitchens, eat the food they eat, and even have meetings in their living rooms! 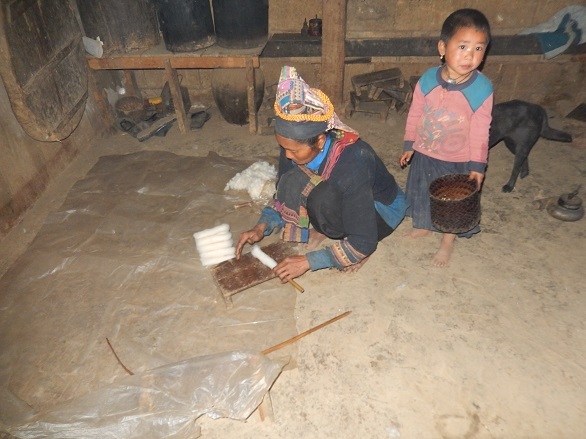 If you click on the picture below an amazing world of village life in among the Rshi people we work with in northern Laos opens up for you. 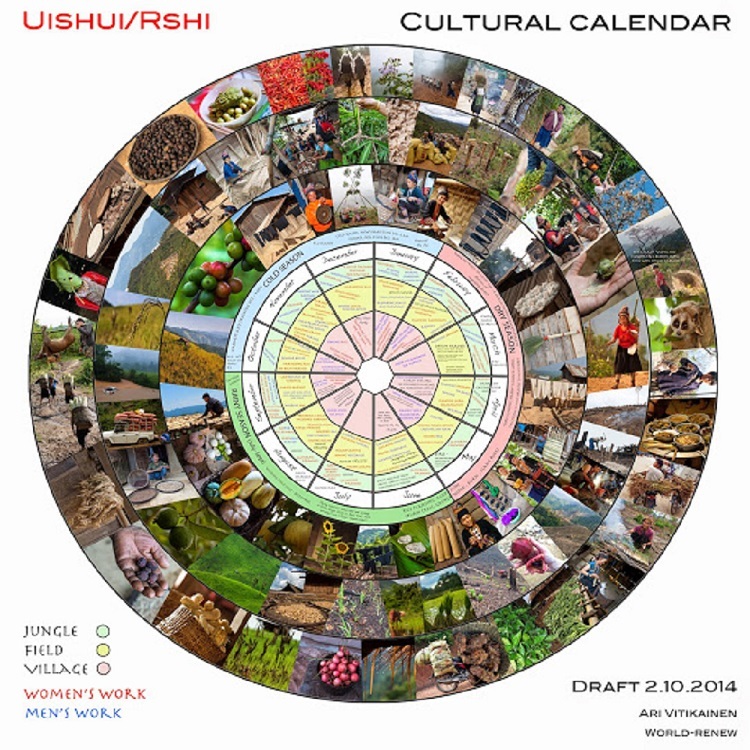 Thanks to a wonderful photographer, Ari, for sharing this photo collage calendar. Every people has a story. And, it’s often and inspiring thing to listen to people tell their story or their history. 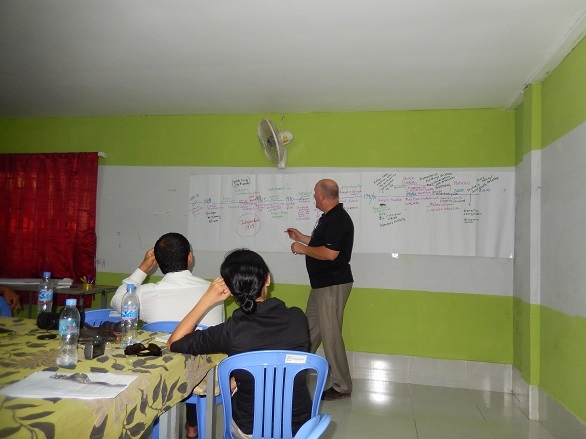 In this case I’d like to share some snap shots of the story young Cambodian Christians shared with us a couple of weeks ago. 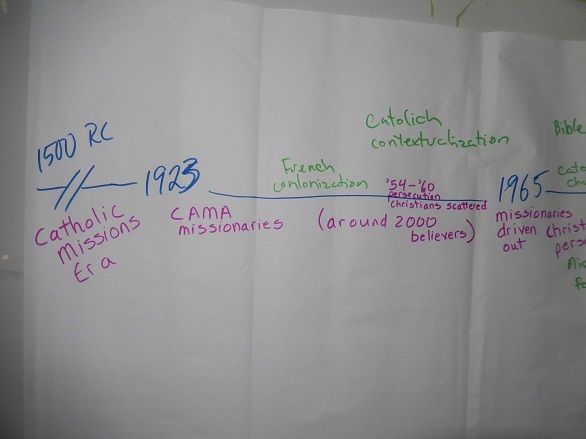 It’s a timeline story of colonialism, persecution, war, refugee camps, missionaries, and now a young church in a young country. It’s a story with some wonder in it: How has God been working in times of colonialism, persecution, traumatic war in Cambodia? 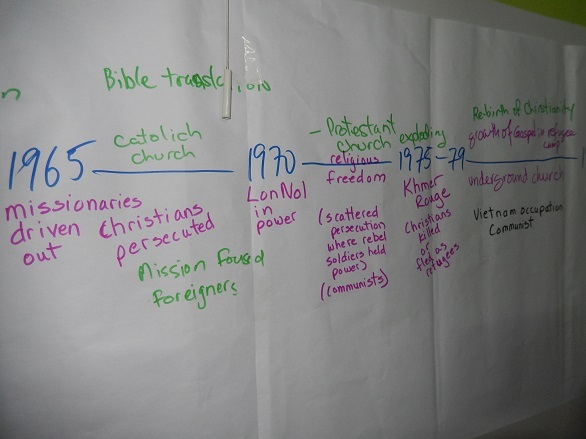 From the 1500s, Roman Catholic missionaries came to Cambodia. In 1923 the first Protestant missionaries came. There were only about 2000 Christians in the whole country during much of the French colonial period. In 1965 the missionaries were driven out. There was a Bible translation in the 1960s. I’ve heard that it has no punctuation and that the verse numbers have been used instead of commas and periods—- as pause points for the readers. The Lon Nol rule began in 1970. (My understanding is that Lon Nol’s regime was supported by the US government during the Vietnam War era.) There was a time of religious freedom before the 1975 withdrawal of the US forces from Vietnam. There was a time of terror. 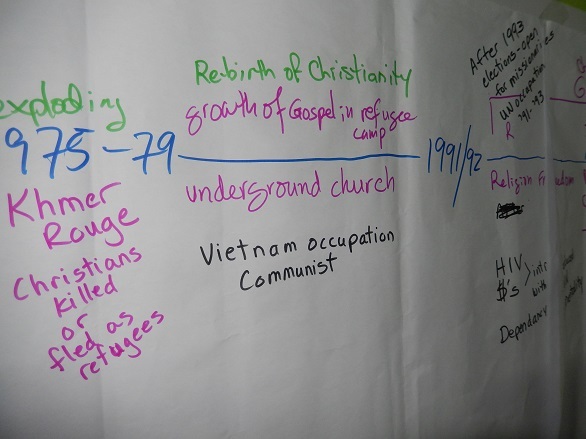 In 1975 the Pol Pot reign of terror began and Christians were killed; many people went to refugee camps. 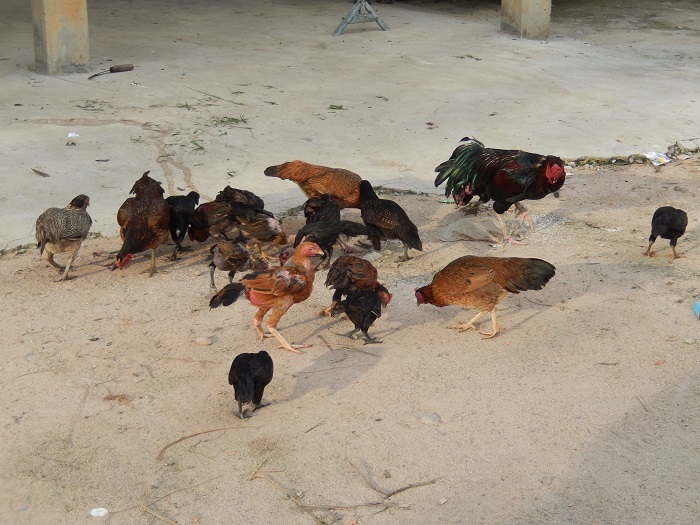 Other Christians became an underground church in Cambodia. In the camps many became Christians. Vietnam invaded Cambodia in 1979 to put a stop to Pol Pot’s Khmer Rouge regime. 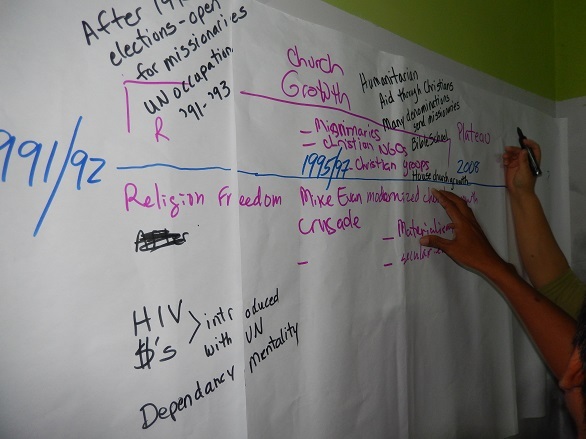 The UN peace keepers brought in a wave of international funds and also HIV in the years between 1991 and 1993. The Christian Church grew rapidly. 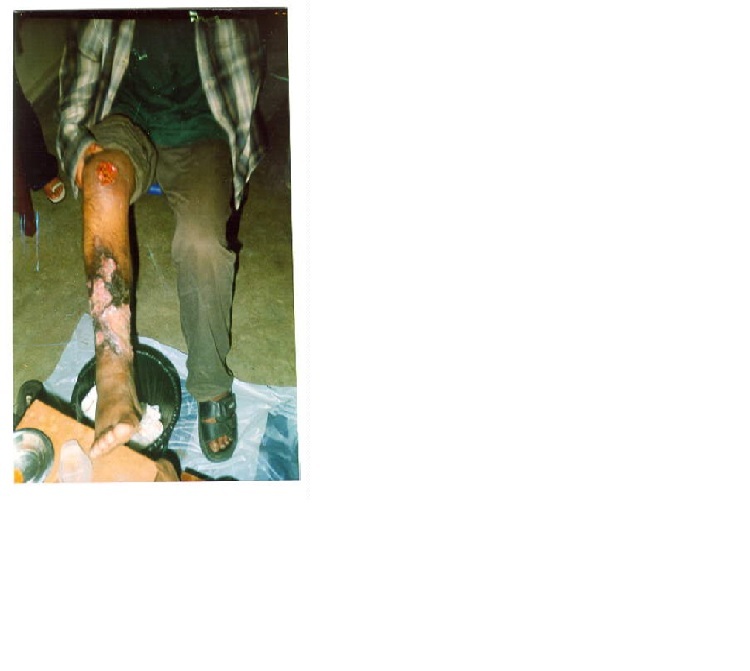 There was an evangelistic crusade around 1995-6 that promised healing miracles. Some people sold their land or animals in order to pay for healing miracles that did not happen. The name of Christ was shamed. 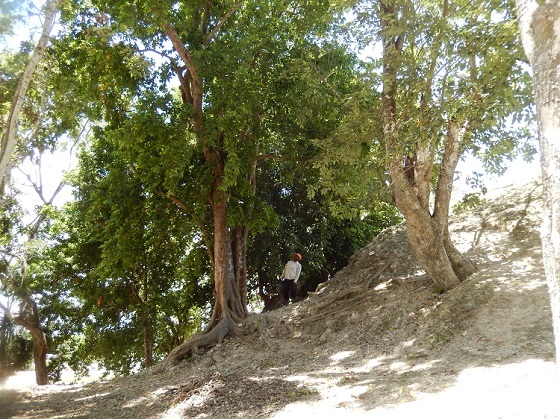 The thing I wonder about is why some trees grow so well in the soil on top of the ancient Mayan City of Santa Rita while other trees struggle mightily. 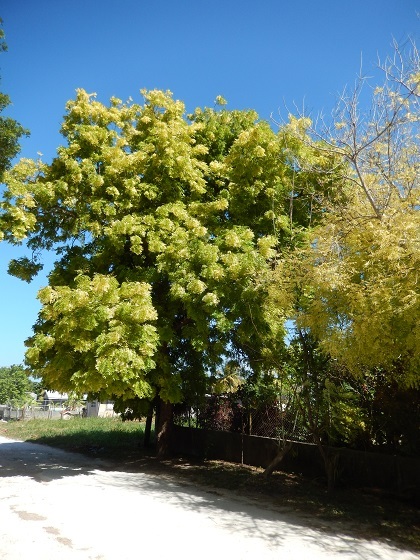 Some trees live on for years with yellow leaves and dead ends of their branches. Archeologists say that the seeds of the bread nut tree are said to have been one of the things Mayan people ate during times of drought. These bread nut trees still grow just fine on top of the ruins of Santa Rita. 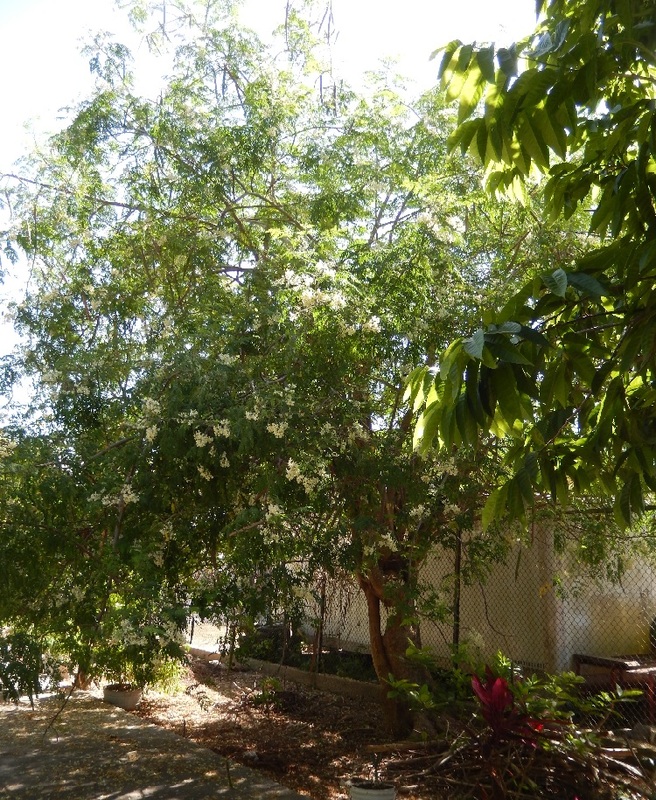 The neem tree and the jacaranda tree both have yellow leaves, but the neem has grown big and strong while the jacaranda has dead branches and struggles to survive. 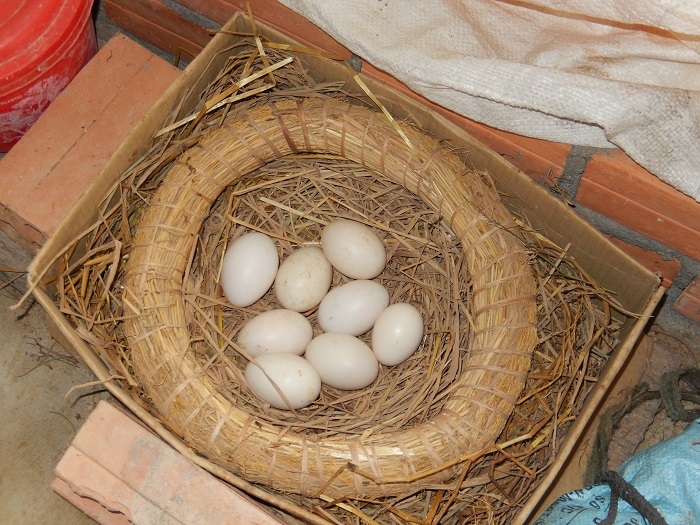 Although the tree struggles, the chachalaca made her nest in it. Sometimes the moringa trees die in this soil and sometimes they continue living for more than 20 years. 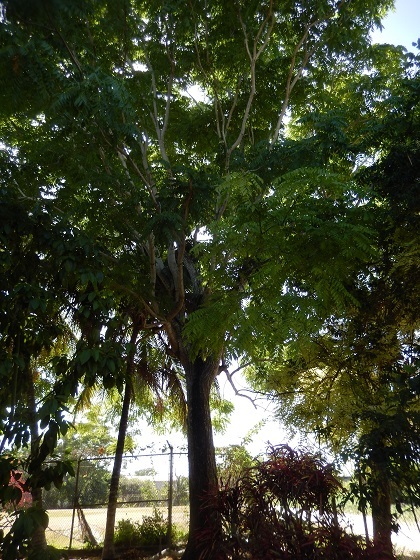 The Mexican Cedar tree is well-adapted and thrives here. When the dry season lasts too long, it sheds its leaves, acting like a deciduous tree in the tropics. The ebola disease outbreak is really frightening. But, fear should not paralyze us. There is a lot to learn about in this ebola story. Part of the story is about bats. Lots of think of them as creepy creatures and almost never see them nor want to see them! For me, it was an amazing site to see those swirling shapes in Lira, northern Uganda. There must have been thousands of bats hovering over those trees. I wish I had taken a picture, but it was getting dark and we were all tired. (So, the pictures below are some that I’ve found on the internet.) That was back in April. 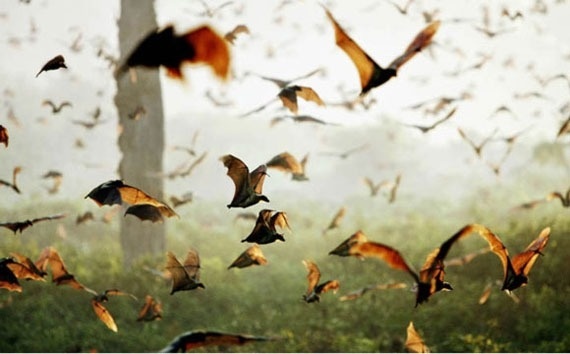 In July I started hearing about the ebola outbreak in West Africa as probably linked to people eating bats, an idea that would have never occurred to me except that I had seen that great swarm of bats in Uganda. Yes, I can see how easy it would be to catch bats or shoot them to eat. 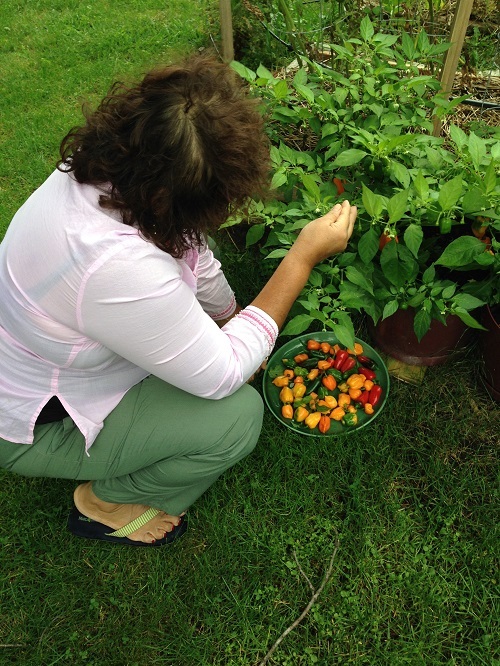 Easy pickings! 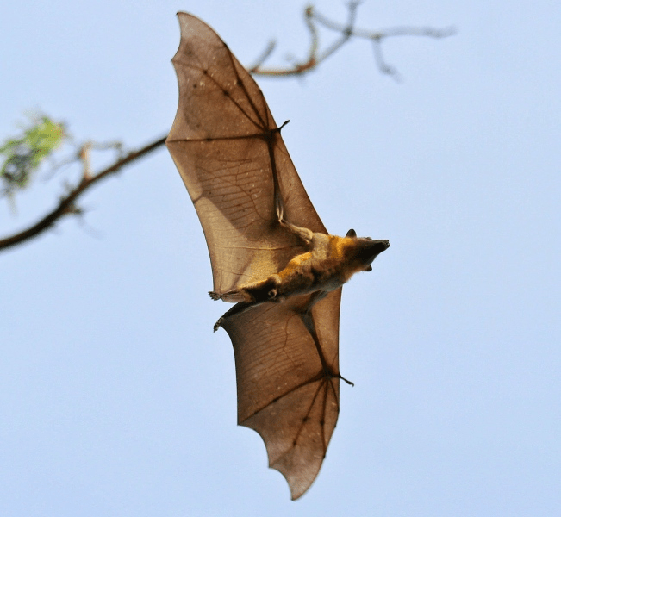 The straw-colored fruit bats could well have been what I saw. 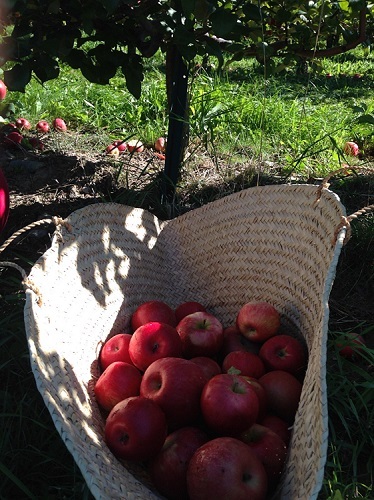 Here is picture that shows them flying in good light.